To pluck or not to pluck! That is the ear plucking controversy. If you are grooming at home, you may have a breed that requires plucking. If not, the ears should be routinely checked and cleaned at least once a month. 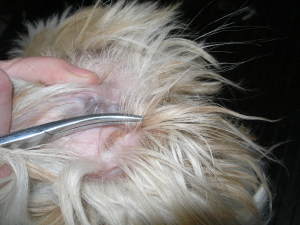 Many breeds have an over growth of hair inside the ear canal. If there is an excess of hair, some of the hair must be removed. Plucking ears is a double edged sword. If you pluck all the hair, it could cause an ear infection as the dirt and wax builds up on the ear canal walls rather than the hair. If you don’t, an excess amount of hair in the ears can prevent air flow through the canal which can also produce an ear infection. I suggest the following, to leave a few hairs in the ear canal. Unless your veterinarian recommends to completely pluck the ears. Of course there are some dogs that hate having any hair in the canal and will scratch the ear if even one little hair is present. Pluck the ears clean with this type of dog. If your dog is scratching its’ ears a noticeable amount, check to see the amount of hair in the ears and for any signs of an ear infection. some hair can definitely be plucked out. Scratching a lot. 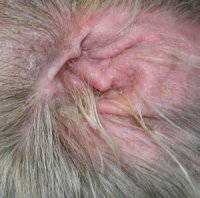 You may even notice that one ear is matted more than the other. Whining may accompany the scratching. Rubbing his head on furniture or on the floor. Yelping if you touch or scratch anywhere around your pup’s ears. Cocking his head to one side repeatedly. They need to go to the veterinarian! 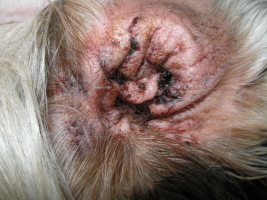 Do not ear pluck or clean them until you have visited the veterinarian! bathing methods where the ear hasn’t been blocked by cotton and water has entered the ear canal. Swimming in dirty water is also a culprit for ear infections. Too much hair in the ears allows moisture to collect and prevents the ear from breathing. Underlying medical issues such as allergies, can also contribute to ear infections. 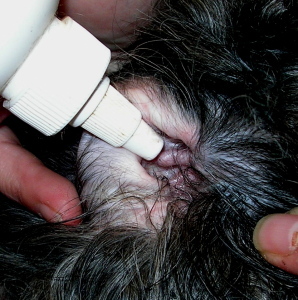 Parasites such as ear mites, are big culprits of producing ear infections. Excess hair, dirt and wax. Whether you have a hairy eared canine or not, the ears should be checked on a regular basis and dirt or debris should be removed. massage the base of the ear (where the ear joins the head). You will hear a squishy sound as you massage. The dog or cat will shake its head. 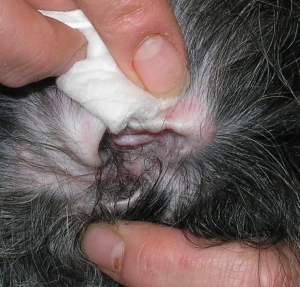 Let the ear cleaner set for a few minutes, then wipe out any dirt or wax from the ear with a cotton pad. Using a clean cotton pad, roll it up, work it into the ear canal and twist it around to pick up and dirt deep in the canal. You may have to wipe the ears a few time over the next half hour, depending on how much dirt is in in them. Do not use water! Ear cleaning products are designed to evaporate quickly and are safe to use. Cats do not need their ears plucked. 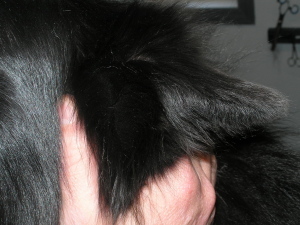 Certain breeds have excess hair growing in their ears. Some of the more popular breed are; schnauzers, poodles, bichons, shih-tzu or a mix of these breed. 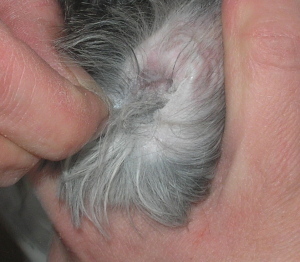 Ear plucking is sometimes essential with these breed. However, the amount of hair that grows in the ears depends on the individual dog. Plucking is relatively simple. You can use your fingers or some forceps. Fingers Grasp a few hairs with your thumb and index finger and gently pull them out. That simple. Forceps Grasp a few hairs in the forceps, tighten the forceps and gently pull the hairs out. With forceps, you can twist the hairs around the forceps to make removing the hair more efficient. 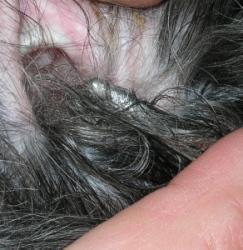 Ear plucking can easily be done when you are doing your regular brushing. The more you pluck, the easier it is. I compare it to plucking your eyebrows or to shaving. The first time you pluck your eyebrows, it hurts, but the more you do it, the less painful it is. If you have had a beard for a few months, then shave it off, your skin is sensitive, but if you shave every day after that, the sensitivity lessens. The same thing applies to ear plucking, the more you do it, the less sensitive the ears become to it. 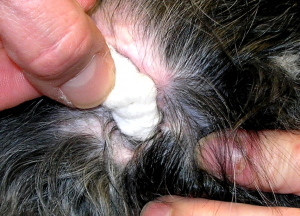 The easiest way to get your dog accustomed to ear plucking is to do it a little at a time. There is no law that says you have to pin your dog down and thoroughly pluck his ears in one shot. As a matter of fact, by doing this, you may create a dog that turns rabid every time someone approaches his ears. You can pluck a couple of hairs every day or every second day, just like plucking eyebrows or shaving. If you feel uncomfortable plucking or cleaning ears, many groomers will do it for you without doing a full groom. Veterinarians will also do it on a regular basis.